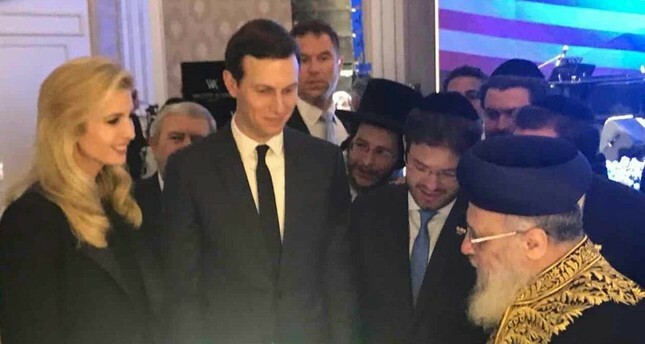 Ivanka Trump and her husband Jared Kushner were blessed by one of Israeli top rabbis, who was criticized for referring to black people as "monkeys" and argued that the country should be free of non-Jews. Rabbi Yitzhak Yosef, who represents Israel's Sephardic Jews of Middle Eastern and North African descent reportedly blessed the couple before they attended the opening of the new U.S. embassy in Jerusalem Monday, which sparked criticism worldwide. The rabbi had been criticized for his racist remarks, as the New York-based Anti-Defamation League called them "racially charged" and "utterly unacceptable." He had also gotten into trouble before for suggesting secular women behave like "animals" because they dress immodestly. The U.S. officially moved its embassy from Tel Aviv to Jerusalem on Monday in a ceremony attended by Ivanka Trump, Jared Kushner and a video address by President Donald Trump. At least 59 Palestinians were killed by live fire from Israeli security forces near the Gaza border, while over 1,500 others were injured.